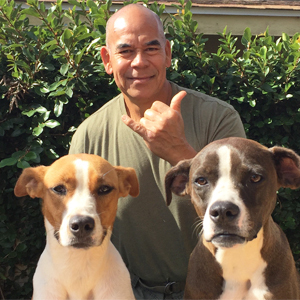 Rusty Radona is a retired Honolulu Police Officer of 30 years, twenty-three of which were with the Specialized Services Division. “SSD” includes Tactical operations, Helicopter, Explosive Ordinance and Canine Units. SSD tactical operations are hostage rescue, barricaded suspects, search warrants, missing persons, dignitary and witness protection. SSD also supports agencies like F.B.I., D.E.A., T.S.A., N.S.A., State Sheriffs and all branches of the United States ARMED FORCES. Rusty was also an instructor for tactical rifle, handgun, less lethal, Taser and simunitions. He also trained as a sniper and became part of the HPD’s first Tactical Emergency Medical Technician Unit. In 1999, Rusty was selected to SSD’s canine unit. Serving seven years of Narcotic detection, Tactical and Patrol support. In 2007, Rusty switched to K-9 explosive ordinance detection. Rusty trained “green” dual purpose dogs on odor, controlled aggression, e-collar training, air scenting, tracking and article searches. Rusty participated in numerous public relations K-9 demonstrations including D.A.R.E., the Special Olympics and the “Make-A Wish” foundation. In 2010 Rusty was certified as a Vohne Liche Kennels Patrol and Detection Canine Trainer. He served as HPD’s head K-9 trainer and assisted in the K-9 selection process for the department before retiring in December 2015. Rusty continues to work with dogs and serves as a volunteer Police Officer training the HPD Narcotics Vice Division K-9 Unit. He coordinates canine seminars, K-9 demonstrations and joint K-9 training with other agencies.